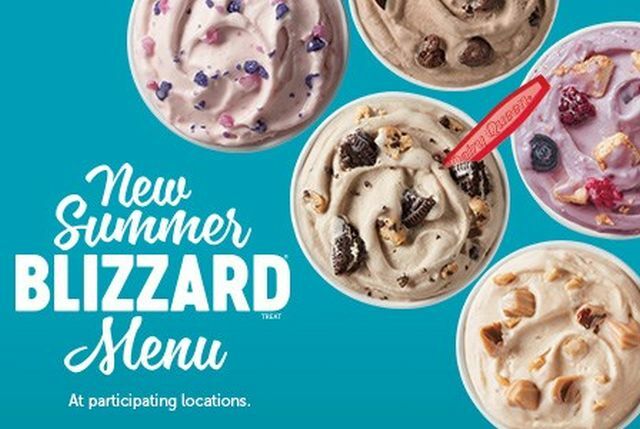 Dairy Queen debuts the new Oreo Cookie Jar Blizzard as the Blizzard of the Month for April 2019. The limited-time Blizzard is part of a seasonal selection of Blizzards on this year's new Summer Blizzard Menu. The Oreo Cookie Jar Blizzard features Oreo cookie pieces, chocolate chip cookie dough, and fudge mixed into Dairy Queen's signature vanilla soft serve. - Brownie Dough Blizzard - Brownie dough, choco chunks, and cocoa fudge blended with vanilla soft serve. - Summer Berry Cheesecake Blizzard - Raspberries, blackberries, blueberries, and cheesecake pieces blended with vanilla soft serve. - Caramel Cannonball Blizzard - Caramel-coated caramel truffles, toffee pieces, and caramel topping mixed with vanilla soft serve. - S'mores Blizzard - Marshmallow-filled chocolates and graham cracker pieces blended with vanilla soft serve. - Cotton Candy Blizzard - Cotton candy sprinkles mixed into vanilla soft serve.